Do you know anyone with a holiday booked? Perhaps you have a friend who travels a lot for business or pleasure or maybe you’d like to take someone special on a relaxing shopping trip? This Christmas give a unique gift with a voucher for Unicorn Courtesy Cars. 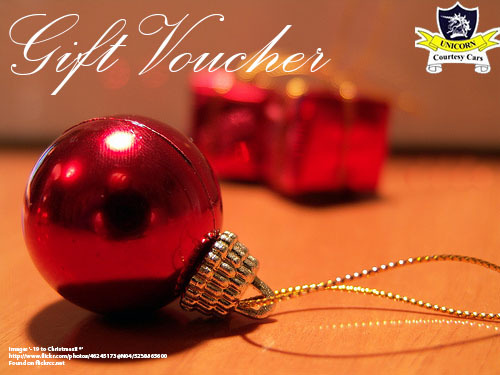 Vouchers are available in all amounts. We accept credit card payments over £50 face value plus £1 admin/ postage fee. Otherwise please send us a cheque with a stamped addressed envelope enclosed. Unicorn Courtesy Cars provides high quality airport transfers, cruise transfers, bespoke tours and chauffeured shopping trips.